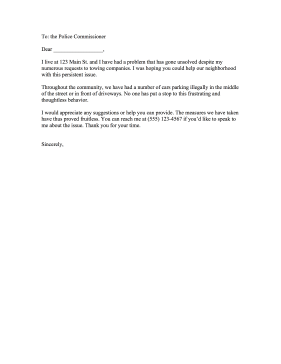 Addressed to the police department, this complaint letter aims to stop illegal parking in neighborhoods. I live at 123 Main St. and I have had a problem that has gone unsolved despite my numerous requests to towing companies. I was hoping you could help our neighborhood with this persistent issue. Throughout the community, we have had a number of cars parking illegally in the middle of the street or in front of driveways. No one has put a stop to this frustrating and thoughtless behavior. I would appreciate any suggestions or help you can provide. The measures we have taken have thus proved fruitless. You can reach me at (555) 123-4567 if you'd like to speak to me about the issue. Thank you for your time.